Increased mucus drainage in toddlers could be the result of an allergy, a viral infection such as a cold or flu, or a bacterial infection, such as sinusitis. The mucus drainage may present as a runny nose or the mucus can drain down the back of the throat and cause a sore throat and coughing. Although mucus drainage has different cause, the methods for decreasing the drainage are similar and can work for multiple conditions. Consult with your pediatrician before administering any pediatric medications, especially the first time. Give your child a pediatric formula antihistamine for allergy-related drainage. During an allergy attack, the body creates histamines, which cause the runny nose and itchy, watery eyes. The antihistamine stops histamine production to allow the sinuses to dry up. 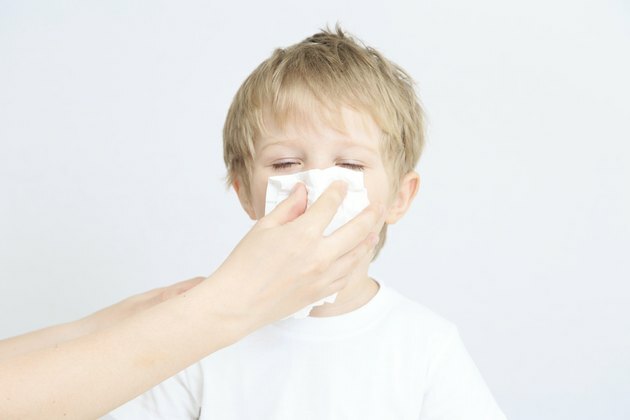 Give the child a pediatric decongestant in either a pill, liquid or nasal spray for a viral infection. During a viral infection, the mucous membranes become inflamed and increase mucus production. The decongestant shrinks the tissues and reduces mucus production. Use a pediatric cold medicine that combines both an antihistamine and a decongestant for a viral infection. Pediatric cold formulas may also contain a cough suppressant and a non-aspirin pain killer. Together, these drugs relieve swelling, reduce mucus production and dry out the sinuses while also relaxing the cough reflex and reducing your child’s fever. Consult your pediatrician if the symptoms last more than 10 days with a low-grade fever, thick yellow mucus and swelling around the eyes. Your child could have a bacterial infection and will need antibiotics in addition to the other remedies.